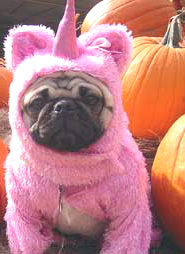 Seems Oso wasn't the first pug to try on a unicorn costume. Check out this photo sent in by Sheldonista Victoria G. I love this guy's face. It's saying "My dignity...draining away..."